The brand that he is most closely associated with is expected to stage a tribute to the workaholic creator, the most prolific of the past century. 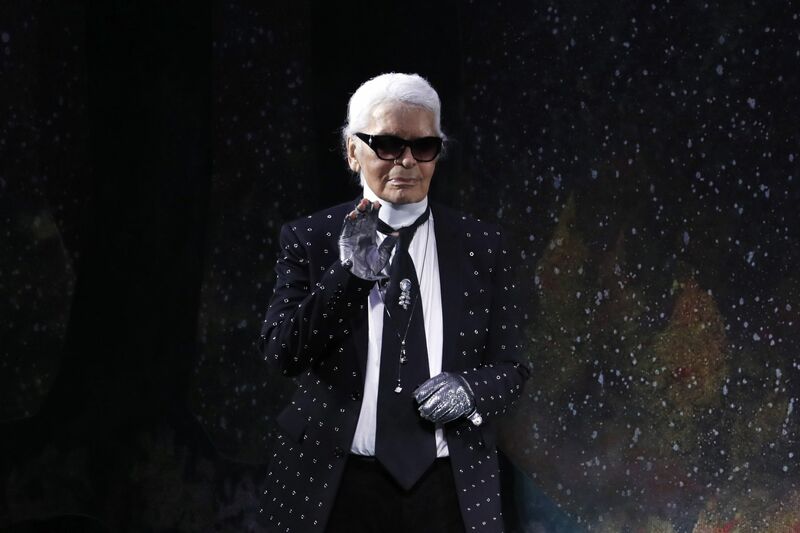 Lagerfeld died aged 85 on February 19, less than a month after missing a Chanel haute couture show at the vast venue in the centre of the French capital, saying he was "tired". Chanel said that "a farewell ceremony will take place at a later date" after the German-born designer's no-fuss cremation attended by only his closest friends and colleagues. But it is unclear whether Tuesday's show, on the last day of Paris fashion week, will be given over to a homage to the "Kaiser", who led the iconic French house for nearly four decades. Chanel can look to few precedents for handling the occasion. In the first Versace show after its founder Gianni Versace was murdered in 1997, his tearful sister Donatella was surrounded by supermodels on the catwalk to take the bow before a celebrity-packed front row that included Lagerfeld and fellow fashion legends Giorgio Armani, Miuccia Prada and Donna Karan. The high emotion of that occasion is unlikely to be replicated in Paris, with Lagerfeld's friends insistent that the famously dry wit would have hated a grandiose display of mourning. There is also much speculation about whether his beloved fluffy white Birman cat, Choupette, will be present. Lagerfeld is reported to have left a substantial slice of his estimated US$200 million fortune to the cat, which is looked after by a bodyguard and two maids. Choupette is also something of a social media star, with a large Twitter following. The catwalk tributes to Lagerfeld began in Milan, where his final collection for Fendi, the Italian brand he had led since 1965, was shown only two days after his death. The Fendi family turned the show into a hasty memorial, showing a video of Lagerfeld at work with the screen flashing up the message "54 years together". They had earlier taken out full-page ads in international newspapers showing him on the terrace of Fendi's Rome headquarters under the headline: "Thank you Karl for the most beautiful journey." Silvia Venturini Fendi, an acclaimed designer herself who had worked closely with him, reminisced about a conversation they had only a few days before, saying all he was interested in was the collection. "We are going to miss him terribly," she added. The French brand Chloe paid a low-key homage on Thursday to the man who spent 25 years in two stints at the brand. A compendium of his wit and wisdom was left on every seat at their autumn winter show. Virginie Viard, Lagerfeld's right-hand woman for the last 30 years, and on whom he leaned heavily in his final years, will present his last Chanel collection. The German called her his "right and left hand", and Chanel's owners moved swiftly last week to scotch rumours that her time as the creative head of the house will only be temporary until they line up another big name. In a statement, its owners the Wertheimer family confirmed their "confidence in the team that worked with Karl Lagerfeld for over 30 years". Viard will effectively be a joint artistic director with longtime executive Eric Pfrunder, who will look after the brand's image. Before Lagerfeld's death, Pfrunder had laughed off rumours that the British designer Phoebe Philo, formerly of Celine, was being groomed to succeed Lagerfeld. Chanel released one of Lagerfeld's last interviews earlier this week, a podcast in which he extolled the virtues of the label's craftsmanship. "My job is to propose a fantasy," he said.